The 2nd London East Asia Film Festival Programme Announced. Here it is, here it is, hear me jump with joy! The 2nd London East Asia Film Festival has announced its programme and it looks amazing! LEAFF’s successful previous edition has led to its second year, and the festival is getting more and more attention. The 2nd LEAFF will run from 19th to 29th of October in London and it will showcase the best of the best of Asian cinema, including productions from South Korea, Japan, Hong Kong and many more. This year, ODEON Leicester Square will host the opening night of Hwang Dong-hyuk’s period drama The Fortress, starring two of the most prestigious South Korean actors – Lee Byung-hun and Kim Yoon-seok. The festival will close with the tension-packed Takeshi Kitano’s Outrage Coda. What’s more exciting about 2nd LEAFF is that the Festival Director Jeon Hye-jung brought something new to the festival… but let’s start at the beginning. 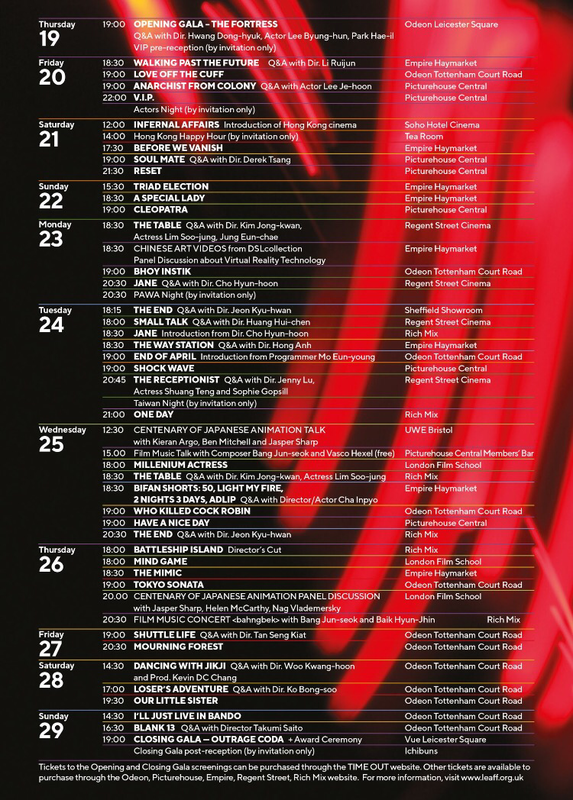 The London East Asia Film Festival has been split into several sections: Official Competition includes The Fortress by Hwang Dong-hyuk, Outrage Coda by Takeshi Kitano, Anarchist From Colony by Lee Joon-ik, Walking Past the Future by Li Ruijun, Battleship Island (Director’s Cut) by Ryoo Seung-wan, Reset by Chang, One Day by Banjong Pisanthanakun, Have A Nice Day by Liu Jian, V.I.P. by Park Hoon-jung, Bhoy Intsik by Joel Lamangan and Love Off the Cuff by Pang Ho-cheung. The Stories of Women – one of my favourite LEAFF sections – will present productions such as The Table by Kim Jong-kwan, Jane by Cho Hyun-hoon (whom we interviewed during Busan International Film Festival last year), Small Talk by Huang Hui-chen and The Receptionist by Jenny Lu. The festival’s line-up already looks promising, right? Apart from the aforementioned LEAFF selections, the audience will also get a chance to watch some exciting films from Hong Kong (Hong Kong: Now and Then) with – in my opinion – one of the most gripping and tense works from Herman Yau: Shock Wave. This year’s festival will put emphasis on the intriguing South Korean cinema with the “Fantastic Film” Festival Focus, including I’ll Just Live In Bando by Lee Yongsun, The End Of April by Kim Kwang-bok, The End by Jeon Kyu-hwan, 50 by Cha Inpyo, Light My Fire by Namkoong Min, 2 Nights 3 Days by Cho Eunji and Adlip – Improvisation by Hee Joonseok – the last four being short films. There will also be something for those who are interested in Japanese Cinema –Retrospective: Japanese Cinema. If you are a fan of Kiyoshi Kurosawa and Hirokazu Koreeda, this section is for you! The Competition part of the LEAFF is also promising; it comprises hits from 2016-2017, from Japan, South Korea, Taiwan, Vietnam, China and Malaysia. Last but not least comes a pleasant surprise for anime fans: The Centenary of Japanese Animation with four films! As you can see, the 2nd London East Asia Film Festival will be a huge event, hosted in a several cinemas across London; apparently, there will be a concert on the menu too. You should also take note that there will be 10 renowned Asian film directors and 7 actors coming to LEAFF! I am already over the moon! Don’t miss your chance and check the official website of the festival for more information, and you can also follow LEAFF on Facebook!